Actually cutting a helical gear is an easy task for a CNC machine. It’s figuring out the math to write the G-code that is the difficult part. Joe Martin designed a helical gear to cut as a CNC demonstration at a trade show, but to do so he ended up writing a program to help figure out the variables. The setup on a Sherline mill. (Click on photo to view a larger image.) Here, we have used a number of Sherline accessories. The 3701 right angle attachment holds the rotary table vertically while the 3702 right angle adjustable tailstock holds a P/N 1191 live center to support the other end of the arbor the gear blank is attached to. The 3701 and 3702 each sit on top of a P/N 3017 crosslide accessory plate to get a little extra height. A P/N 3231 Gear cutter arbor holds an involute gear cutter on the spindle, which is offset to the appropriate angle. The X-axis moves left/right and the A (rotary) axis indexes for each tooth and rotates as the blank is fed past the fixed spinning cutter. 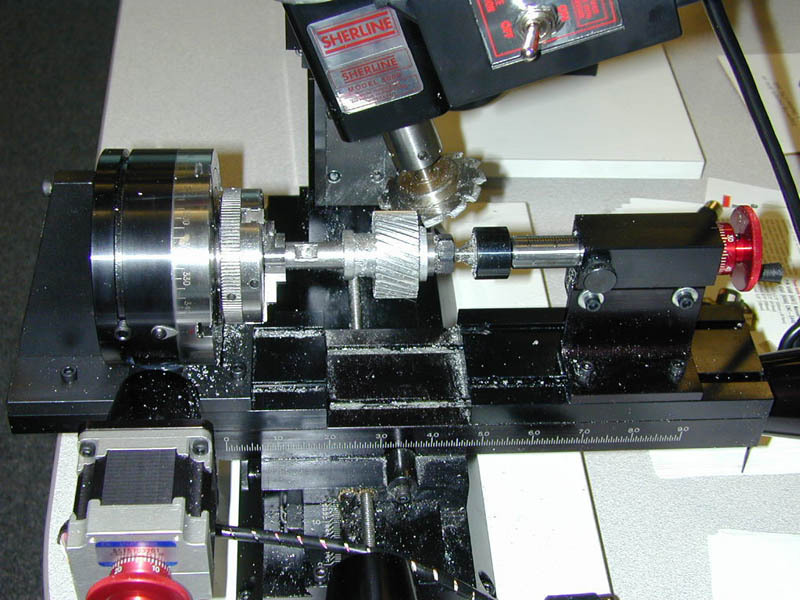 The Y-axis is used manually to adjust the tooth depth or with CNC to cut the gear to the proper depth in a number of passes if needed. (This gear in aluminum could be cut to full depth in one pass.) The Z axis does not move. In order to help with the calculations on a helical gear, Joe Martin wrote a Microsoft Excel® program that helps come up with the unknowns when you have the necessary pitch and angle information. Viewing this program requires Microsoft Excel. To view the formulas that Joe developed to make the calculations you will first have to unprotect the worksheet by going to the “Tools” menu and selecting “Protection>Unprotect”. Then, when you click on one of the cells that contains a formula, you can read the formula in the window above the worksheet. When you are done looking, be sure to remember to protect the file again. Understanding these formulas will require a pretty good working knowledge of Microsoft Excel formulas. Using the sheet just requires that you know the values to plug in to the pink cells. When you change one of those numbers, the formulas will recalculate the values in the orange cells for you. Once you have the values, there is another function included that will write the g-code for you. This clever addition to the program was written by Bill Krobetzcy and his future son-in-law Jeremy. CLICK HERE to view Joe’s Excel Program to develop the values for a helical gear. As you can see, once started only the last number changes in each block of code as it indexes for the next cut. To get the entire 34-tooth program in .txt format, CLICK HERE.